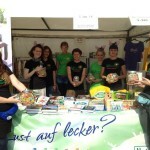 Anniversary: The Vegan summer festival for the 1oth time! 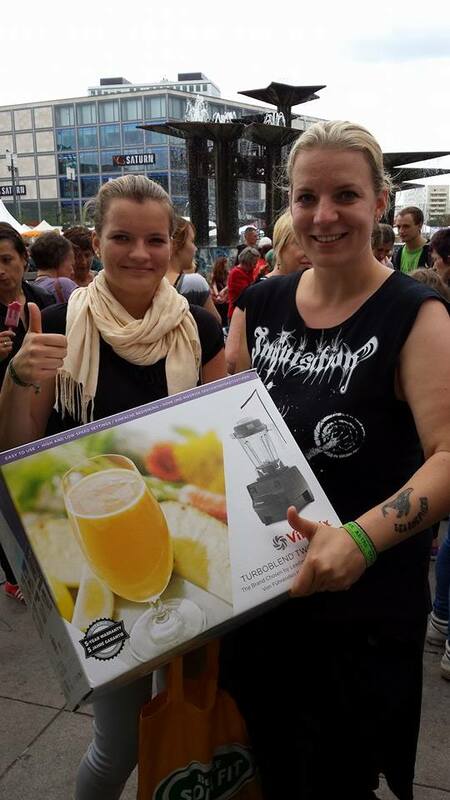 The Vegan Summer Festival took place on Alexanderplatz for the 10th year running, and for the anniversary year there were of course some highlights! 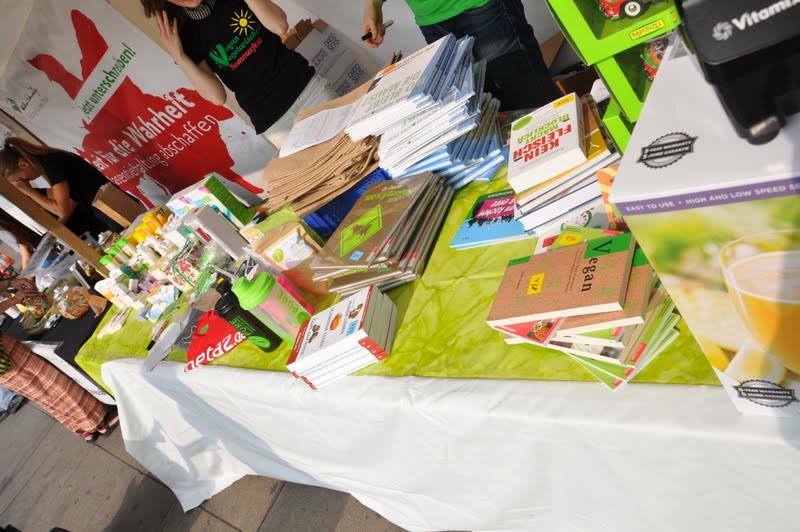 As well as all the culinary vegan treasures that were available at the Festival, there were also various information stands on animal rights, environmental protection, and sustainability. 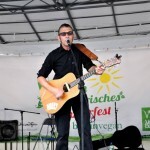 There were also many singer-songwriters on stage, as well as DJs from Berlin and all over Germany. 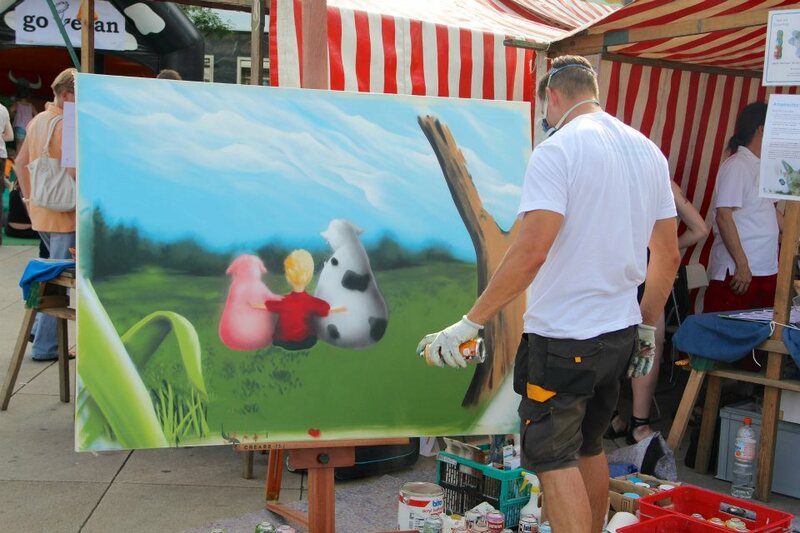 A mix of jazz, electro swing, and acoustic sounds provided the perfect summer atmosphere and spread a good mood among visitors and exhibitors. 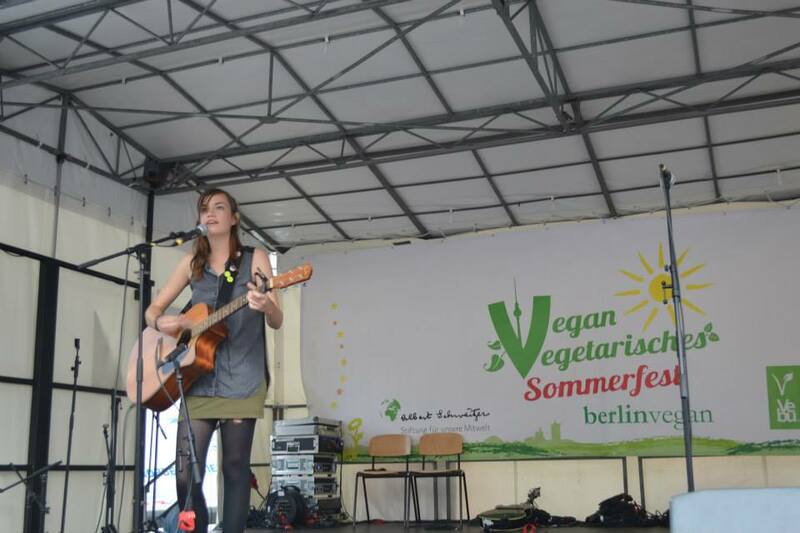 A special highlight was the performance of Jamie Lee, a committed vegan and winner of The Voice of Germany, as well as a participant in the Eurovision Song Contest. 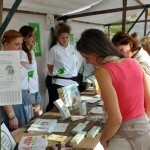 We also had guests of honour in the lecture tent, with ‘Esther the Wonder Pig’ and ‘Vegan is unhealthy’. For our little guests there was no shortage of fun and games. 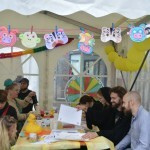 Here, the children could let off steam on the bouncing castle, have funny-animal faces painted, or even become creative through various painting projects and community games. From the 29th until the 31st of August 2014, our festival took place on the Alexanderplatz – lasting three days for the first time! 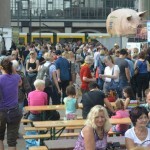 50.000 visitors could From Friday to Sunday, 50.000 visitors could inform themselves about the vegetarian-vegan lifestyle, explore the vegan cuisine and experience a diverse programme. 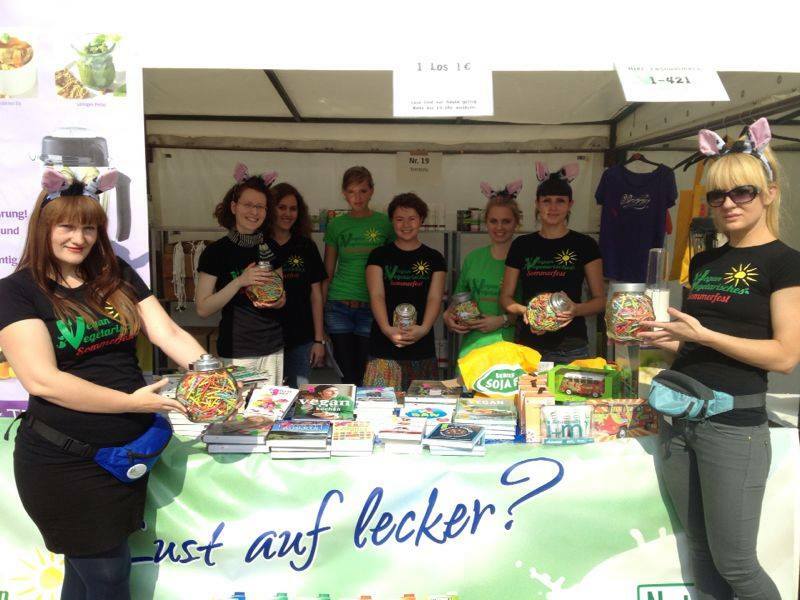 This makes the Berlin Vegan-Vegetarian Summer Festival the biggest of its kind in Europe! 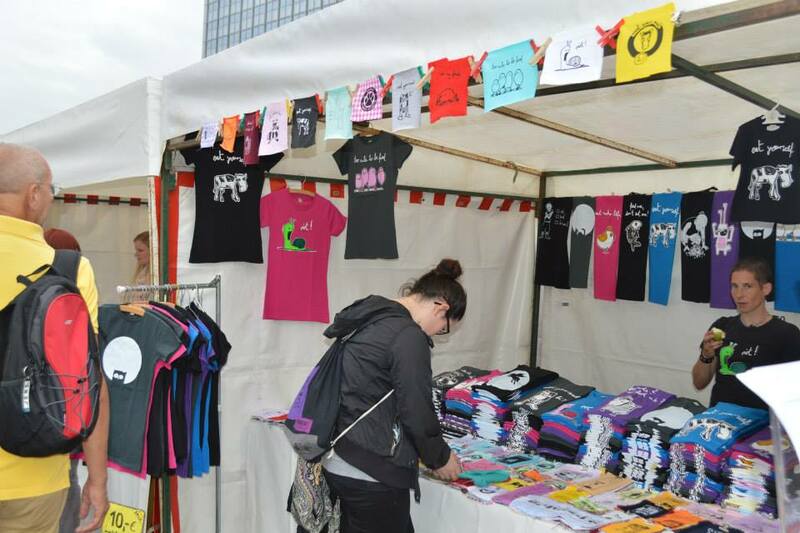 At about 70 information, catering and trade stands there were international treats, vegan organice and raw delicacies, cruelty-free cosmetics, fashion and leather-free accessoires. 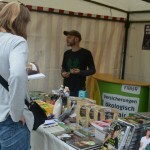 The info stands of the environmentalist, animal welfare and animal rights organisations were well-attended. Active participants reported on their work and answered questions about their engagement. 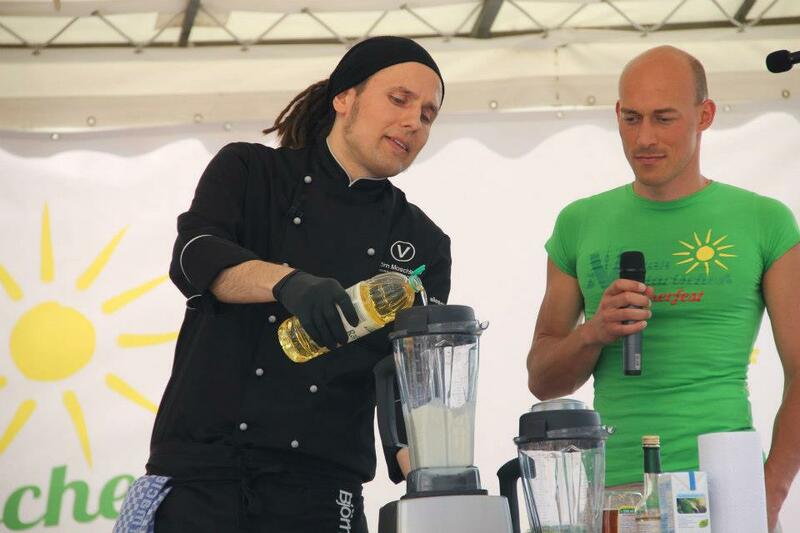 On stage, Björn Moschinski enchanted the crowds with a live cooking show and vegan strength athlete and author Patrik Baboumian moved the audience. 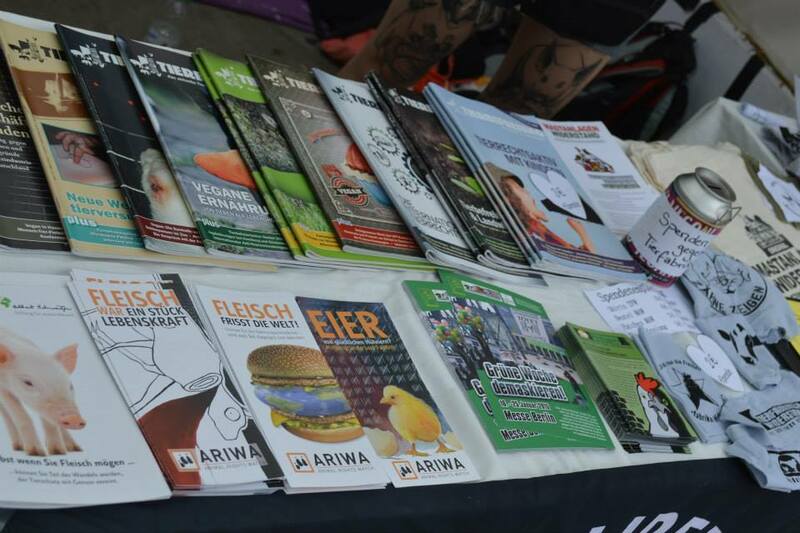 Alongside Berlin-Vegan and the Albert Schweitzer Stiftung für unsere Mitwelt (Albert Schweitzer Foundation for Our Contemporaries), the VEBU was on site to answer questions about the vegetarian-vegan lifestyle. 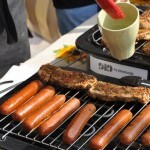 US-American social psychologist Dr. Melanie Joy debated the issue of “Why we love dogs and eat pigs” with the audience. 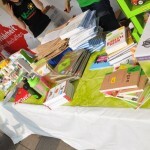 Bestselling author Hilal Sezgin read from her newest book “Hilal Sezgins Tierleben”. 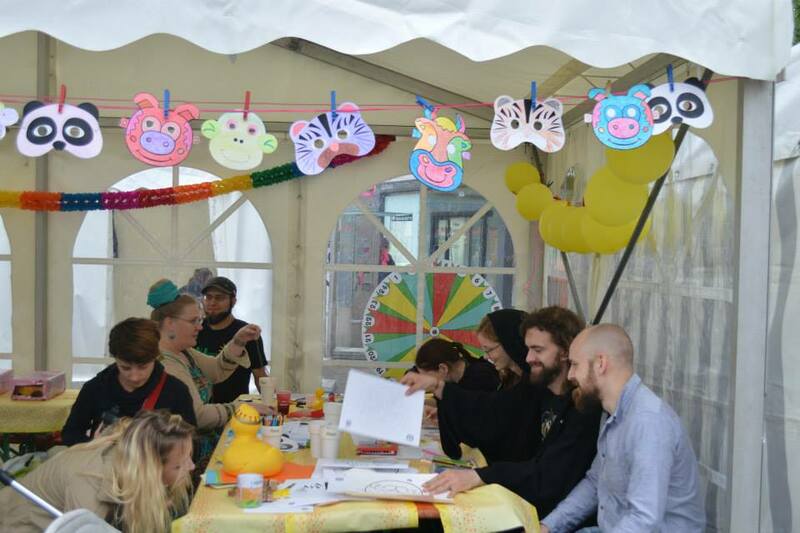 A supervised children’s programme with bouncy castle, face painting and other attractions provided fun to the youngest visitors. 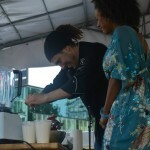 The stage program, which was moderated by Laura Schneider and Frank Metzker, warmed up the visitors of the festival. 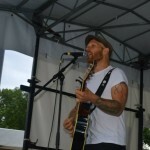 Beside the live music programme with Rock, Jazz and Rap, attendees could dance to electroswing and listen to the sounds of several singer-songwriters. 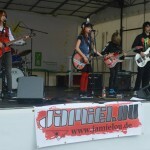 On Sunday, the Berlin band “Berge” played to conclude the festival. 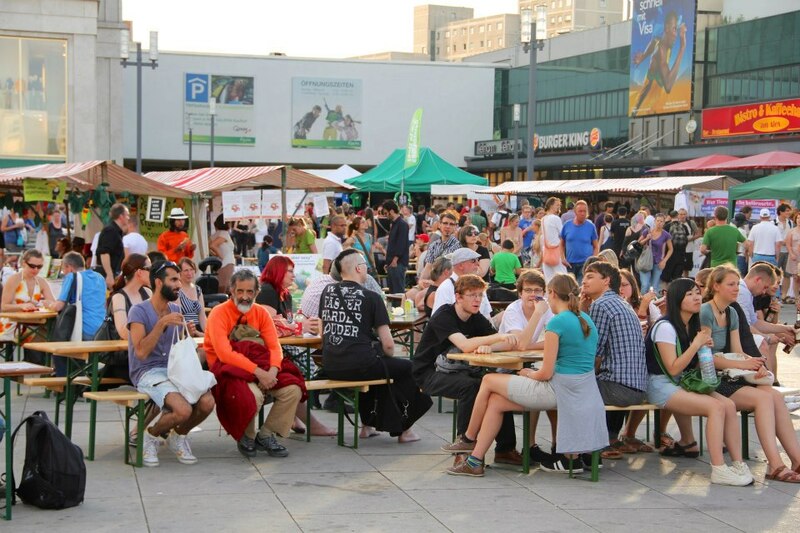 Bigger, more colourful, better: in 2013, we again celebrated on the Berlin Alexanderplatz – with vegan doner, show cooking and live music. 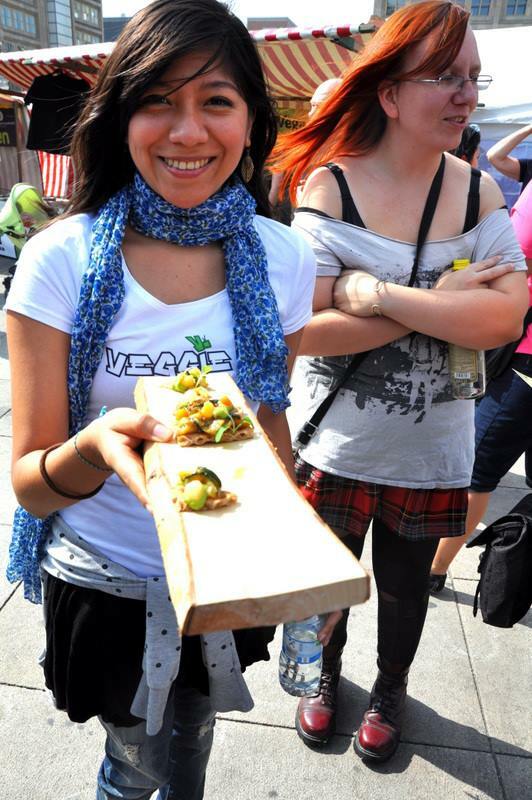 At the 2013 summer festival, visitors big and small had an entire day to inform themselves about the vegetarian lifestyle, have a vegan feast and experience a diverse programme. 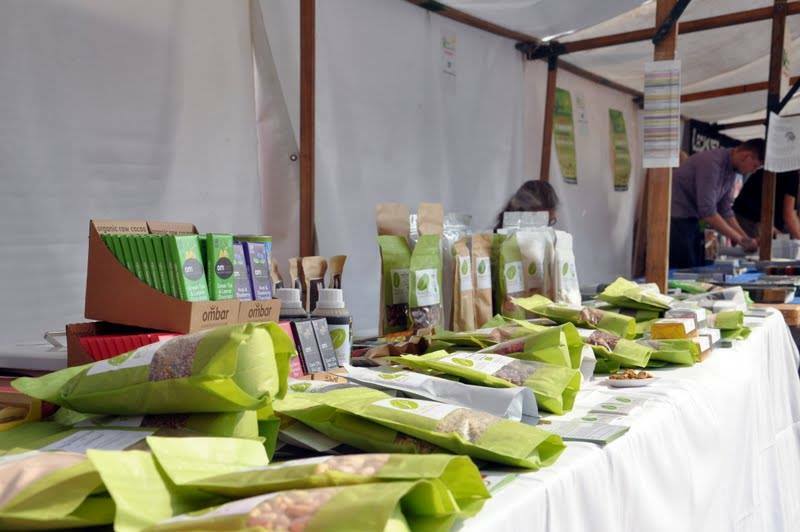 Around 70 information and catering stalls were awaiting visitors with international treats, vegan organic and raw delicacies, cruelty-free cosmetics, t-shirts with great motives and leather-free products and accessoires such as belts and shoes. 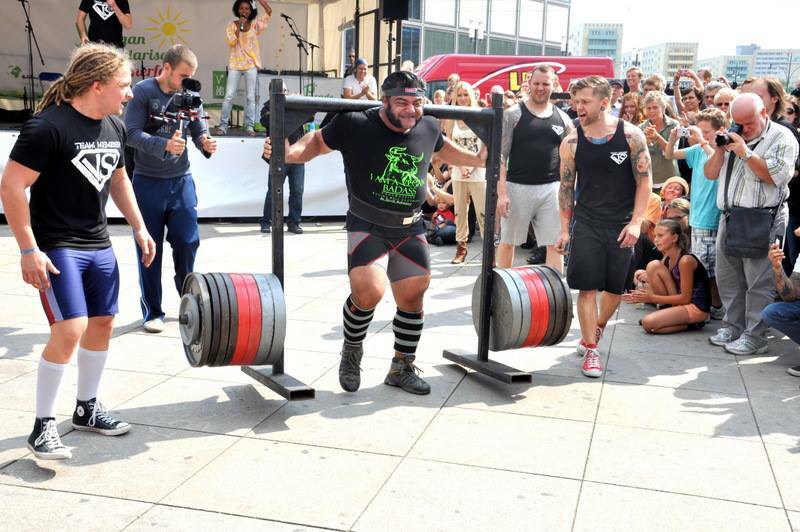 An impressive record was set at the festival: vegan strength athlete Patrik Baboumian, who won the title “Germany’s Strongest Man” in 2011, carried a whopping 555 kg over a distance of 10 metres! 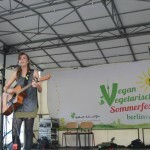 On stage, Emaline Delapaix, Morgaine and Herr Binner ensured a great atmosphere. 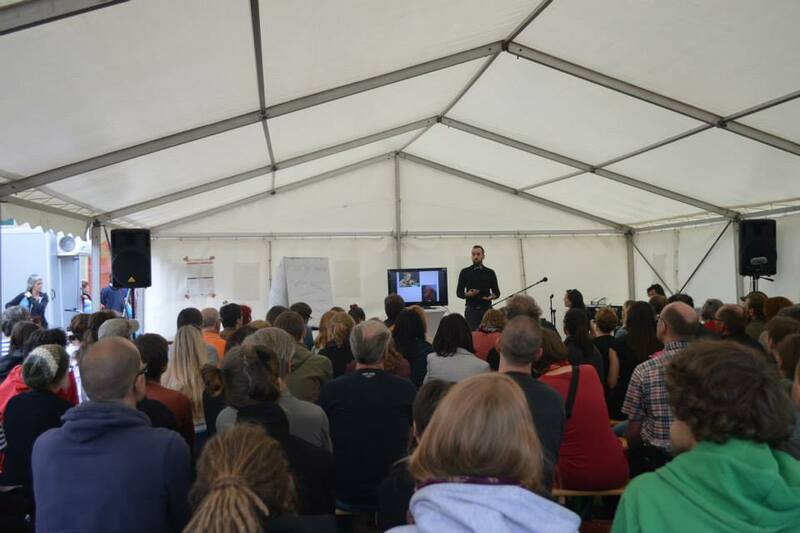 In the congress tent, exciting lectures and readings were given. 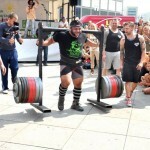 In on it were Raphael Fellmer, Jumana Mattukat and many others. 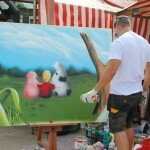 There also was a live show of the programm “MiViZ” with Marsili Cronberg. 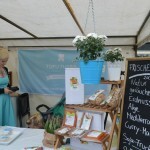 Visitors could push their luck in a tombola with many interesting material prizes: whether restaurant vouchers, cosmetic products or foods – there was something to suit all tastes. 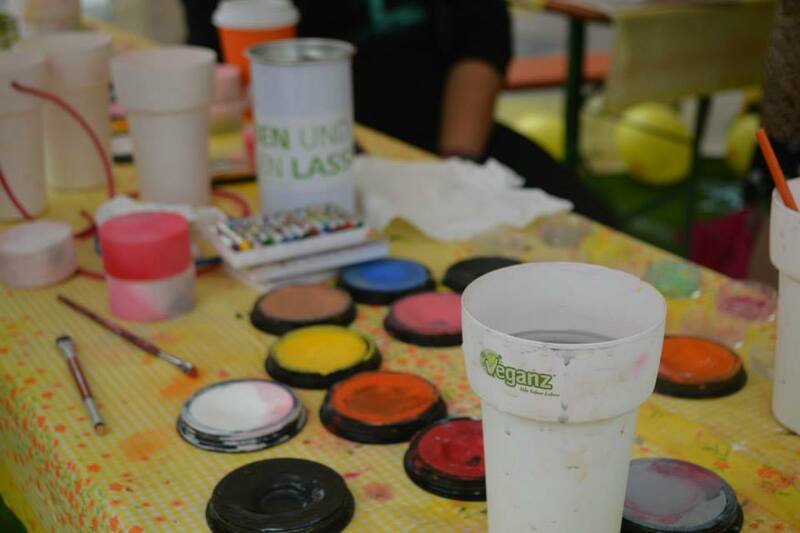 A supervised children’s programme with bouncy castle, face painting and other attractions made sure that the little ones were having fun as well. 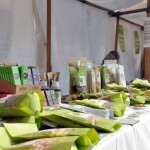 Summer, sun, vitality! 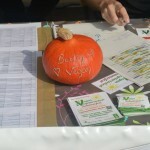 The Vegan-Vegetarian Summer Festival 2012 was a summer festival straight out of a picture book – the sun just wouldn’t stop shining! 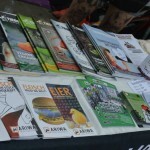 But not only that: In the five-year success story of the festival, 2012 set a new record in terms of both the number of exhibitors and that of visitors. 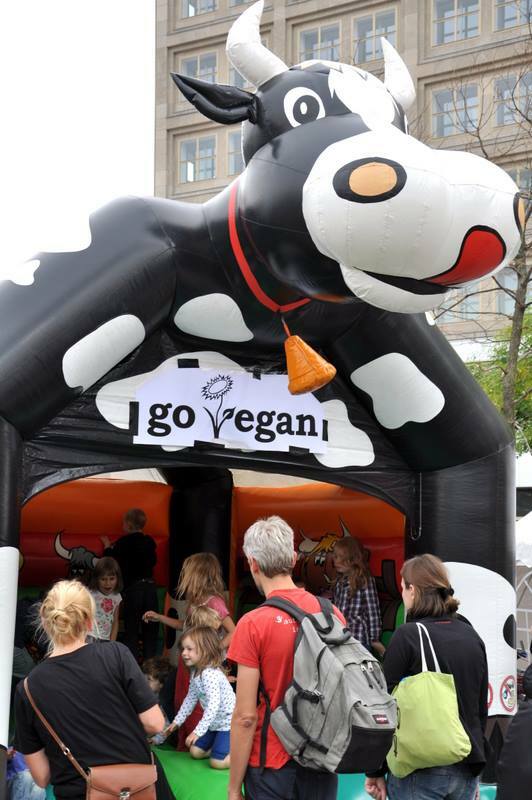 The festival has been growing notably each year since its debut in 2008 – a clear sign that the vegan-vegetarian lifestyle has made its way into the heart of society! 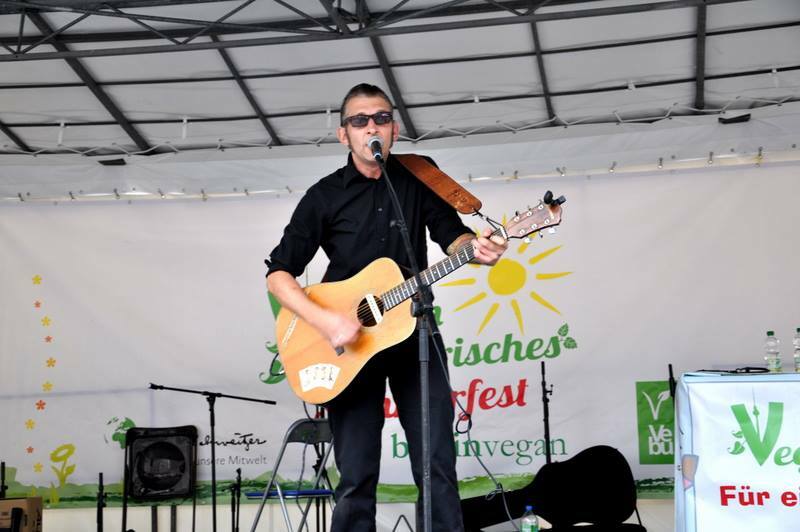 Aside from great live music by “Notic Nastic”, “Orpheus & the Sea” and “Emaline Delapaix” there were interesting readings and lectures by Marsili Cronberg (“Wie ich verlernte, Tiere zu essen”), Andreas Grabolle (“Kein Fleisch macht glücklich”) and many others. 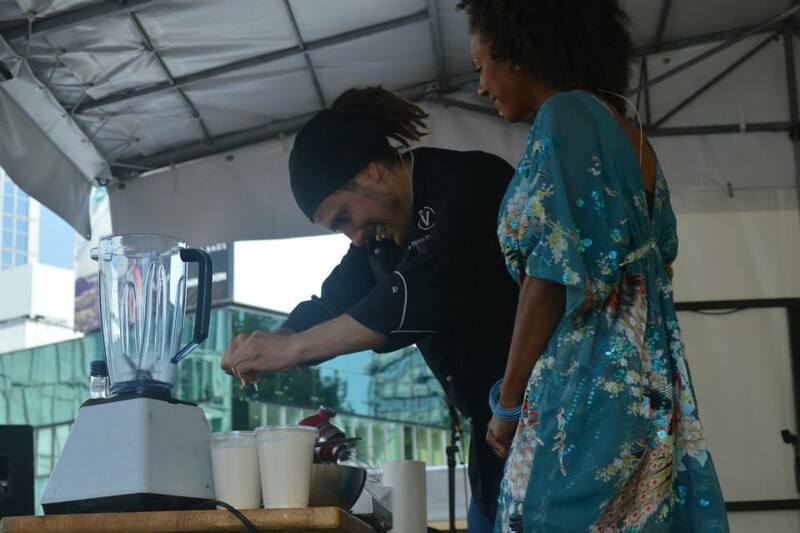 Another highlight was a cooking show by vegan top chef and restaurant owner Björn Moschinski, who demonstrated how to conjure delicious meals (vegan egg salad, gyros and berry shake) using vegan ingredients only. 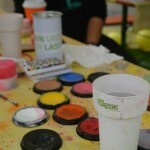 Of course, the little ones were also catered to: they delighted in jumping around on the bouncy castle and having their faces painted. 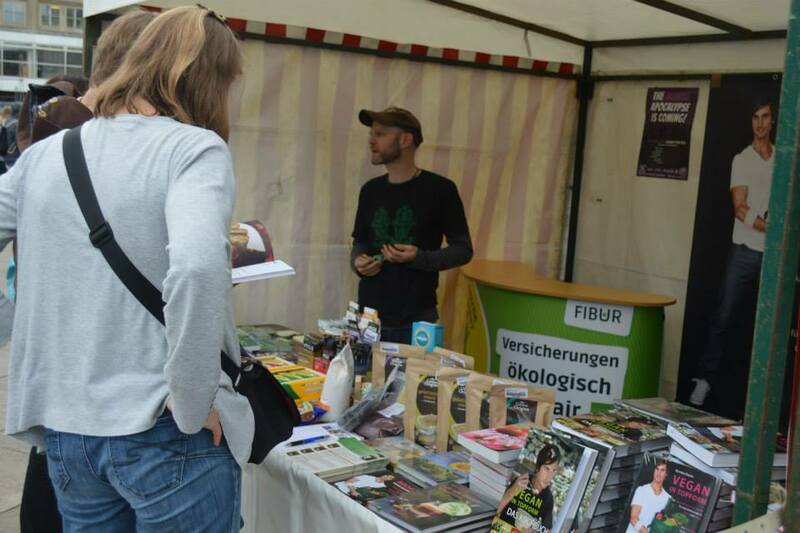 The numerous info and trade stands invited those who were interested to discuss the consumption of animal products and at the same time to relish the vegan product diversity. 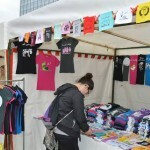 For instance, cruelty-free cosmetics and vegan accessoires such as belts, shoes and t-shirts were presented. 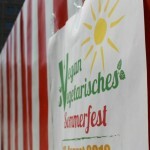 The Vegan-Vegetarian Summer Festival 2011: a huge success despite terrible weather! 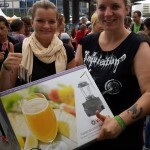 What a summer festival! 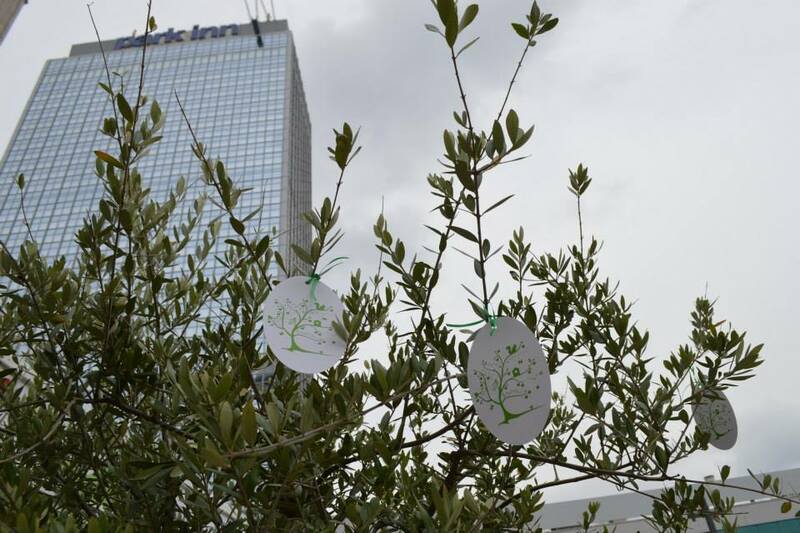 Actually, it was more of a rain festival. 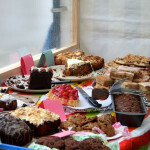 Nonetheless, more visitors braved the wind and rain than we ever could have hoped for, given the weather. 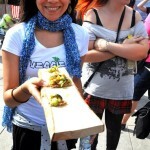 The practically uninterrupted queues at the countless food, sales and info stands show that the topic of vegetarianism/veganism and the knowledge of its enormous significance have reached large numbers of the population. 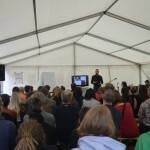 The stage programme provided a good distraction from the grey skies and amused visitors with live bands, presentations and a cooking show. The tombola did its usual and delighted those who had a go with many prizes – in some cases more of them than they could carry. 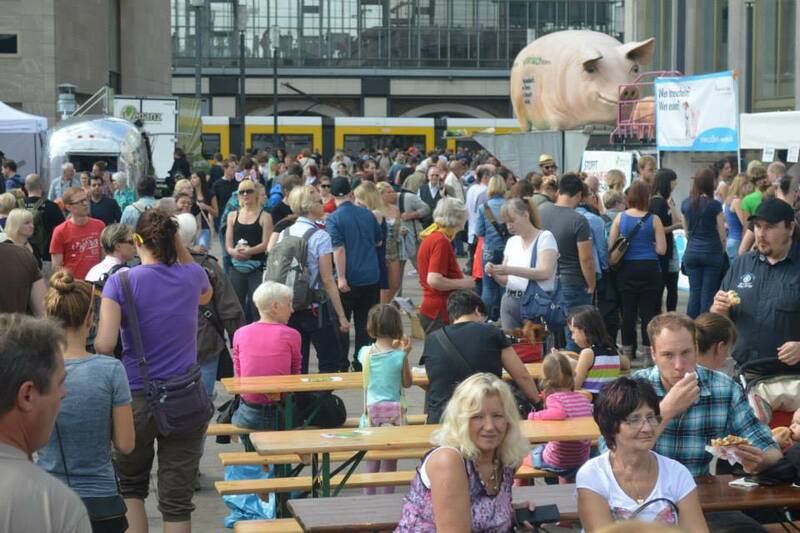 And also the new location at Alexanderplatz proved itself to be a good decision: located in the heart of East Berlin and easy to reach by public transport, the location means that not only those who are already vegetarian or vegan or those coming with a particular interest but also people passing by are confronted with this subject. 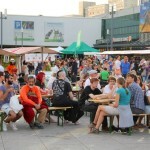 As a result of the massive success in the previous years, it was anticipated that the grounds of the Humboldthain adventure playground would be no match for the influx of people expected at the 2010 festival. 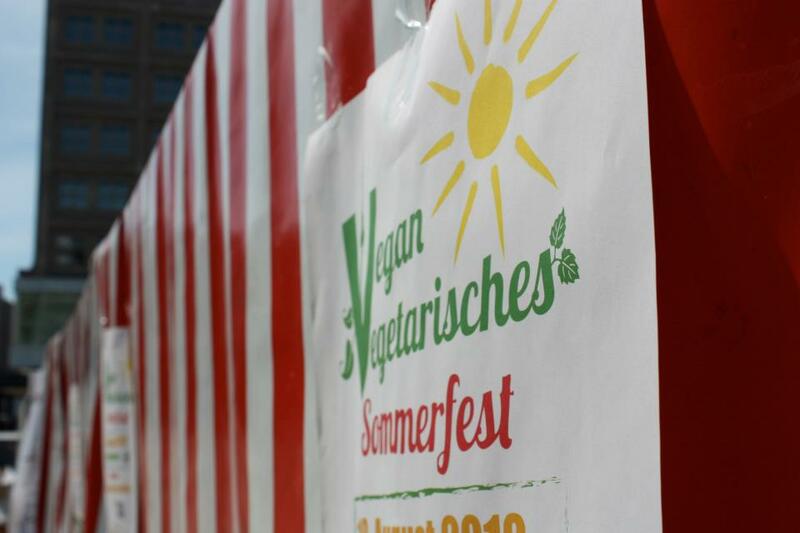 That’s why the organisers from Berlin Vegan completely revised the concept of the festival – 2010’s Vegan Summer Festival was to become a “real” street festival and was also to reach out to people outside of the vegan-vegetarian “scene” more than in the previous years. 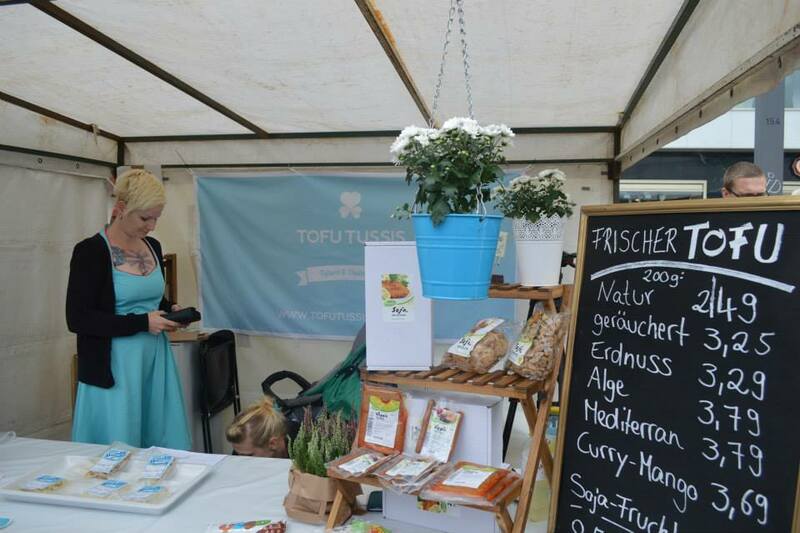 Due to the extra work in terms of organisation, preparation and the handling of all the red tape associated with such a task, a competent partner had to be found – a role that the VEBU (Vegetarierbund Deutschland) performed outstandingly. 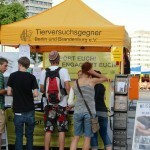 In the middle of the popular Breitscheidplatz in Berlin next to the Memorial Church, the Summer Festival of 21st August 2010 took place in a central location for the first time ever. As in the previous years, the weather gods were kind and were on their best behaviour, with plenty of sunshine and warm weather. 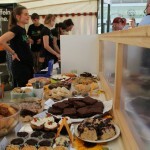 Alongside the various info stands, there were also foods and drinks on offer from professionals for the first time, with the range so rich and varied that you didn’t know what to sample first. 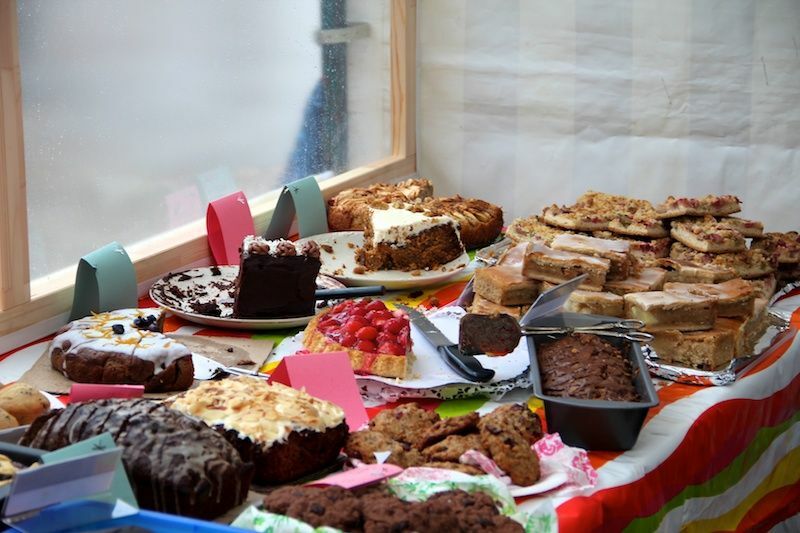 The central point of focus of course – how could it be otherwise – was the ice cream stand with its particularly delicious soy ice cream and sorbet offerings. 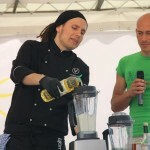 The stage programme was also even more varied and diverse in 2010 than in the preceding years: amongst other things, there was a live cooking show with star vegan cook Attila Hildmann and live performances from the Kafkas, Set-Sails/Nessi and Sookee. 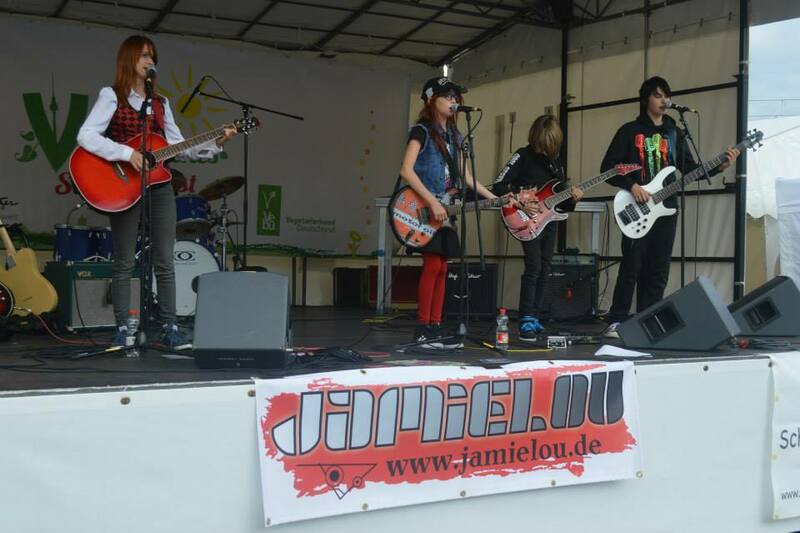 Due to the great success of the previous year, it was decided that another festival should take place in the following summer of 2009, once again at the tried-and-tested location of the adventure playground in Humboldthain. 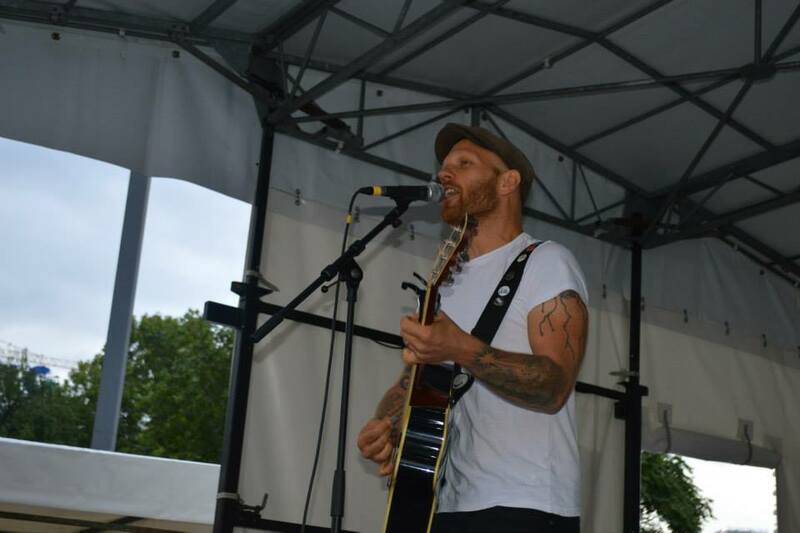 Alongside a free vegan-vegetarian buffet, information stands and a varied fringe programme for the younger visitors, this time there was also live music due to the Fête de la Musique taking place at the same time, with diverse artists such as K. C. McKanzie. 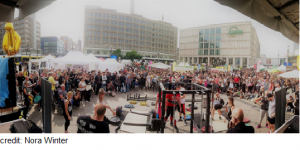 The concept worked out well – around 800 to 1000 visitors filled the grounds of the adventure playground in Humboldthain, bringing it to full capacity. 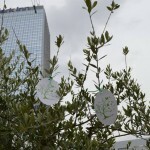 They revelled the whole day long until the early evening hours. 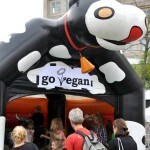 The festival was a sweeping success – even in their wildest dreams, the organisers from Berlin-Vegan couldn’t have imagined such a massive turn out! In the beginning, it was nothing more than a crazy idea. 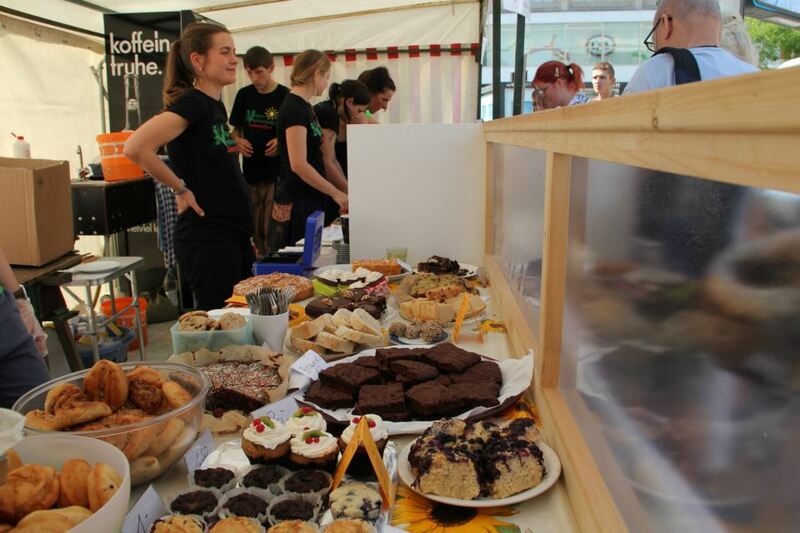 Why not organise a summer festival, where only vegan-vegetarian food is offered and visitors have the opportunity to inform themselves about vegan-vegetarian nutrition, get to know the various animal rights organisations and discuss animal rights topics? 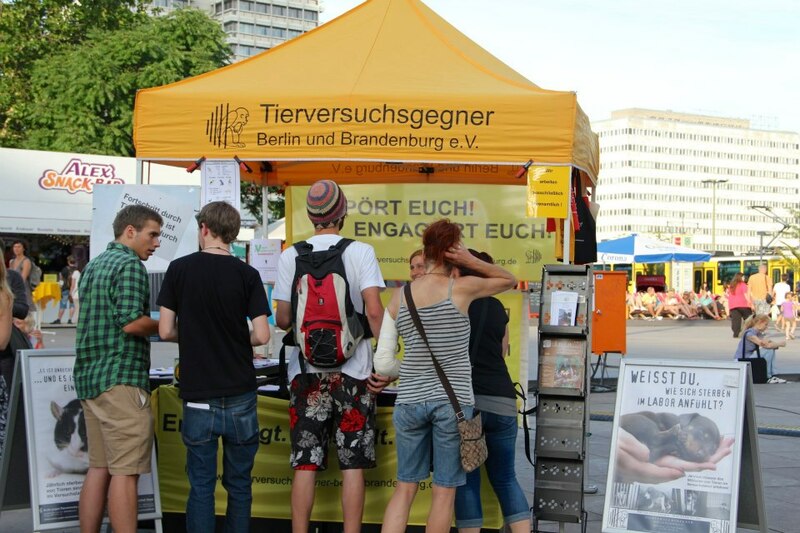 In spring 2008 volunteers of the animal rights alliance Berlin-Vegan asked themselves that question and they decided to organise the first Vegan-Vegetarian Summer Festival in that summer. 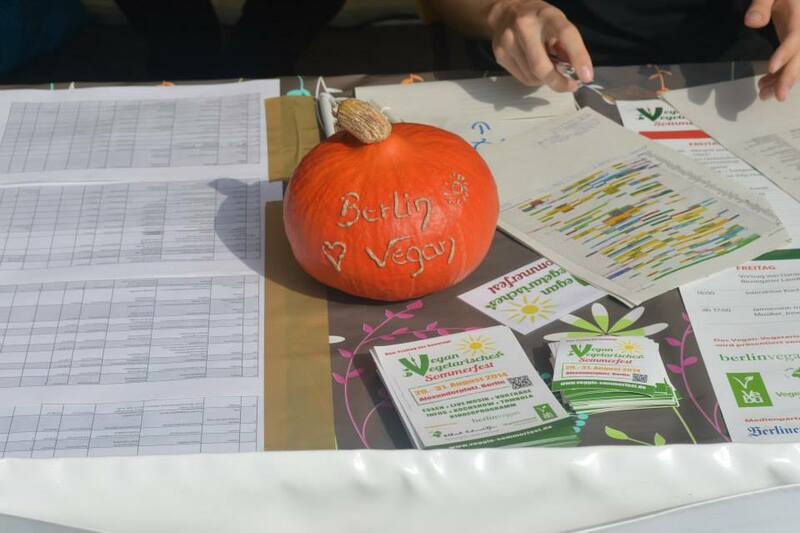 The first Berlin Vegan-Vegetarian Summer Festival took place at the adventure playground in Humboldthain run by the Wedding district office. At that time, the motto was “Free & Outdoors”. 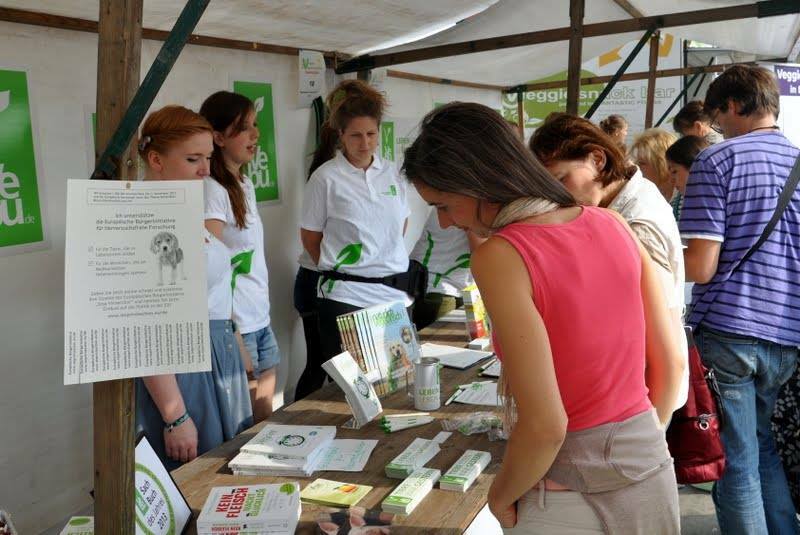 Under this motto, numerous vegan-vegetarian delicacies were offered and at the various stands, information regarding vegan-vegetarian living and other animal welfare topics was provided by the different organisations. As the festival was intended explicitly as a family and children’s festival, the little ones could not only run riot to the heart’s content on the play area but also take part in games or create balloon animals with Clown Aha, while the adults enjoyed the buffet and chatted in the gorgeous late summer weather. 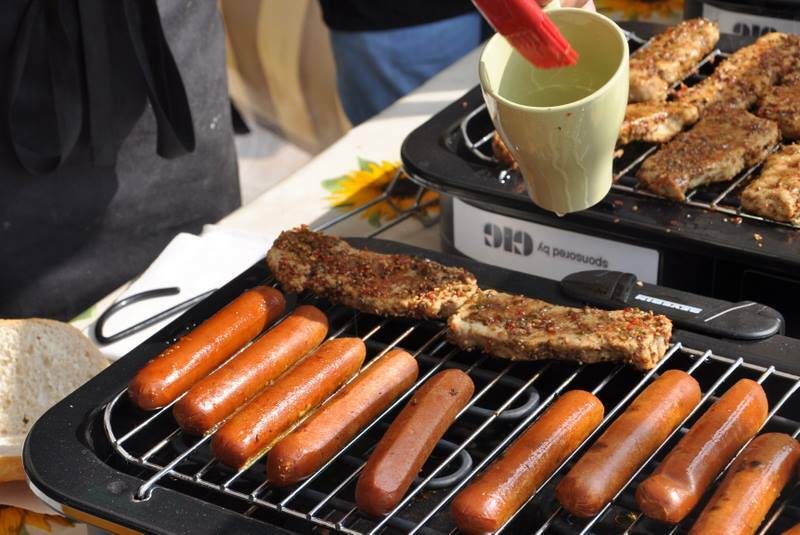 With around 250 to 300 visitors, the Summer Festival was a great success in the eyes of all participants, though it had a very “family-oriented” character.